This was one of my favorite award winners at CES and I was thrilled the 2.0 version has been released. 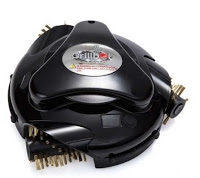 GrillBot has become such a popular consumer electronics product for one main reason: no one enjoys cleaning their BBQ Grill. This fully-automated device makes grill cleaning possible with the simple push of a button. The replaceable wire brushes pop off for easy cleaning and are dishwasher safe. It runs on a rechargeable lithium ion battery and the LCD alarm and timer let you set the GrillBot, walk away and return to a fully cleaned grill. Amazing!